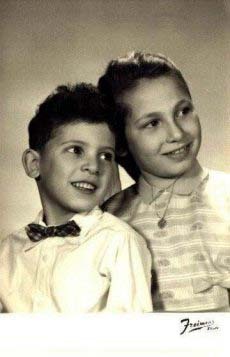 Leah and her brother Leon Krolik (abt 1958). If you are a family member we need your help. This project was started in 1990 using in most part Ortenberg-Stupak data gathered over many years by Michael Ortenberg z”l of Montreal (2nd great grandson of Fivish Ortenberg). Information has added to by Dan Goldstein, Janet Olin Boonov, Stuart Boonov, Lynn Winters Friedman, Cindy Goldenberg, Michael Horton, Aron Ortenberg, Fanny Esterson Kugelmass, Mary Esterson Goodman, Zelda Goldstein Zwirek, Sue Matenko Levy, Paul Matenko, Barry Pekilis and Debbie Pekilis. Barbara Morestsky of Detroit was instrumental in locating the descendants of Shachnes and Ann Ortenberg. Benji Goldstein is the creative genius behind this site. Some of my data is incorrect and much is incomplete. Only with your help can correct update our records. Take a look at the data. If you have information to add or correct please e-mail me. I am looking for information about you, your descendants and your ancestors. Please send dates and locations of birth and death; marriage information; occupation information; migration dates, e-mail addresses and anything else that you think important. We love to receive stories and scanned pictures. Have some news you want to share with others? A story? E-mail me and I will post it. These pages contain just some of the pictures we have scanned. If you want a picture of someone who you don't see here, or others of a person who does appear, e-mail Benji at benj@ourfamilyroots.net and we will e-mail them to you. Send photos and we will try and upload them as well as put them in the family file. Sign the guest book and please make sure to include your comments and e-mail address so that we can be in contact.